The stylish beautiful “Mirror Me™ Beauty Magic Mirror Photo Booth is a 5-feet tall black-framed modern round mirror photo booth (4 feet diameter) featuring an amazing interactive magic glass touch-screen interface, hiding a hi-resolution DSLR camera, powerful computer with professional photo booth software that makes social media and email sharing, GIF animation, real video, green screen, and other customization’s possible. 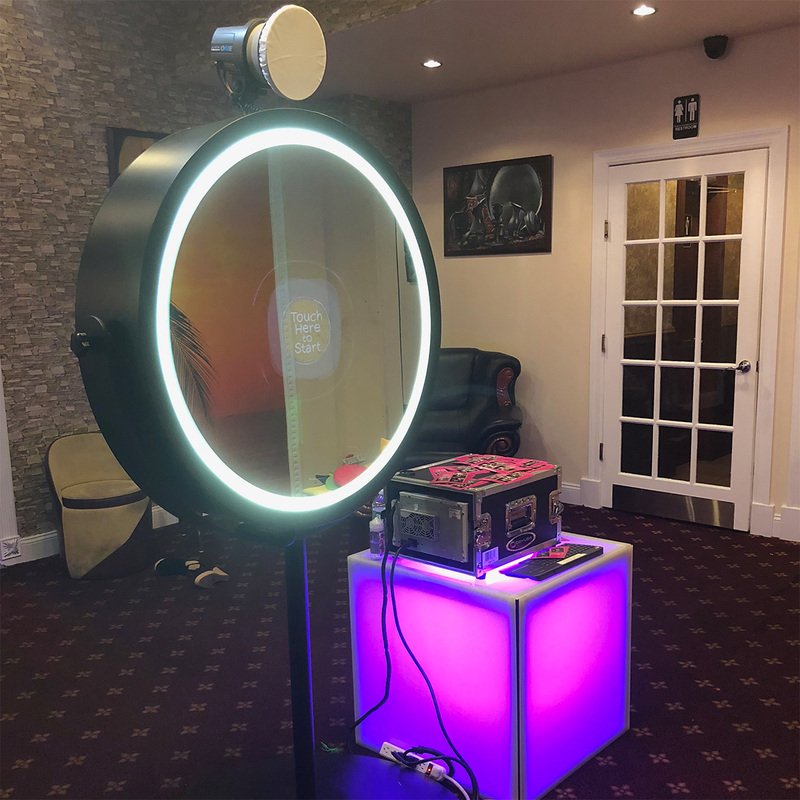 The stylish Mirror Me™ Beauty Magic Mirror Photo Booth is beautiful in appearance and elite among photo booths when you consider it’s powerful technology and uniquely fun colorful user interface. This amazing interactive photo booth is available now for your party, wedding or corporate event; and is included as a comprehensive and complete photo booth experience package – with photo booth rental prices starting at $850 for 2-hours. Complete photo booth rental package (2-hours), anywhere in Brooklyn. Manhattan fee $100. The modern and very fashionable mirror photo booth offers the perfect look to enhance fashion, art and media events or parties where high-style is the theme. Guests will be drawn-in and then fascinated by the interactivity user-friendly interface through a touch screen. This is the official FotoMaster Mirror Me product, not a copy or lesser alternative. 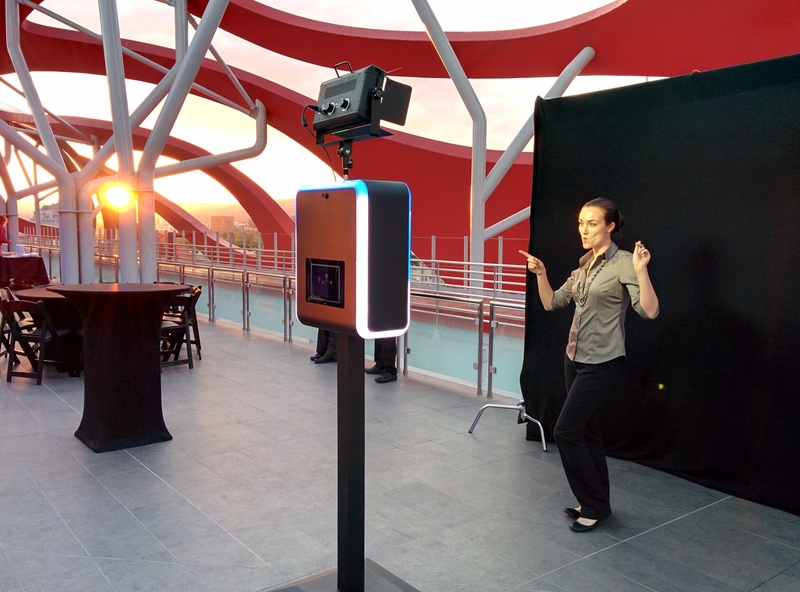 This interactive exciting technology wonder takes your guests photo experience to a new level with options including voice guidance, vibrant animations, touch based photo-signing, emoji stamping, interactive contests, social games, colorful photo countdowns and more. Guests were blown away by the minimalist and stylish mirror that actually an amazing photo booth with colorful animations and a voice guidance to engage in a branded experience resulting in unlimited keepsake photo prints and shared social media posts. 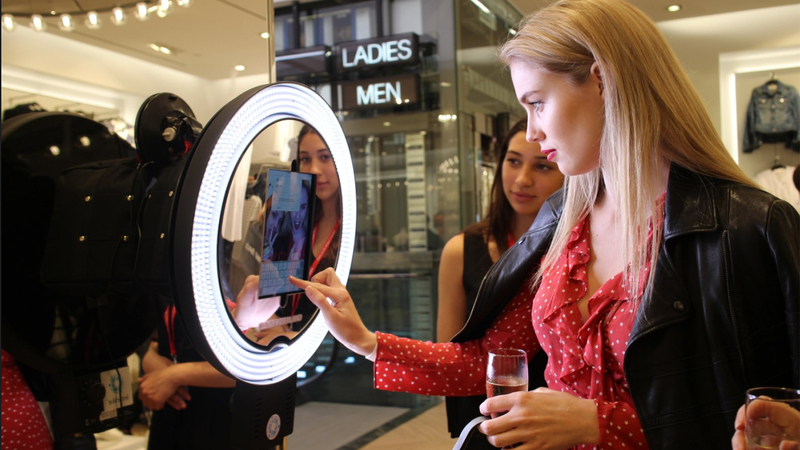 The Beauty Magic Mirror Photo Booth hardware and technology is almost unbelievably powerful and flexible while being easy and fun for guests to use. This fashionable interactive visual or audio presentation attracts the right attention and gets the photo booth event rental attraction noticed and remembered. The number of people that can fit into the photo depends on your set-up, with 10 fitting easily. However 29 people (with full faces) is the most we’ve seen in one photo booth image so far. Photo signing or colorful and customizable emoji stamps. One of the most popular features of the Beauty Magic Mirror Photo Booth is the ability to customize and share media (images, video, audio and animated GIFs) by email or (even better) Facebook, Twitter and Instagram. 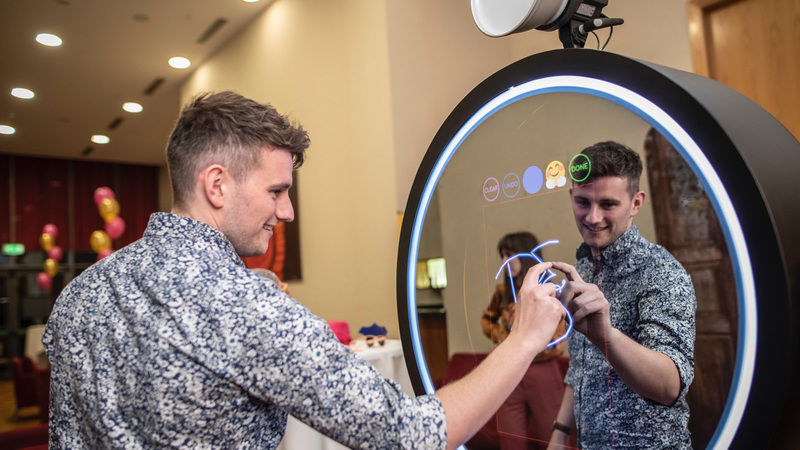 The Retro Magic Mirror Photo Booth is the exciting choice for branding and sharing experiences from high- profile corporate events and trade shows. And your wedding reception guests will absolutely love the email sharing option to share the important event with the important family members and friends that could not attend. The vast majority of photo booth companies do not have one single interactive Mirror Photo Booth, much less many mirror photo booths in several varieties. These mirror photo booths are very expensive to purchase ($8,000 to $25,000) and the technology requires a higher-level of technical skills to operate. This is a big investment in staff, training and equipment which requires a minimum of two operators to set-up the installation and attend the experience efficiently. The 212 PHOTO BOOTH design team can also create custom branded graphical user-flows or make available a wider array of add-on features to include in the interactive Wedding Photo Booth or Corporate Event photo installation. Consider voice guidance, gesture and movement detection, or entertain and brand to guests with colorful bright animations displayed on the mirror user-flow. The touch screen can be used for photo-signing or colorful and fully customizable emoji stamping. Take your own chances with a “Screaming Contest”. Guests can play social games. We can create a custom colorful photo countdown from your images. The Beauty Magic Mirror Photo Booth is 69″ high with a 35.5″ diameter and weighs 86 lbs. Contact us to find out more about our Beauty Mirror Photo Booth. Reservations can be made via the 212photobooth.com official website, as well. 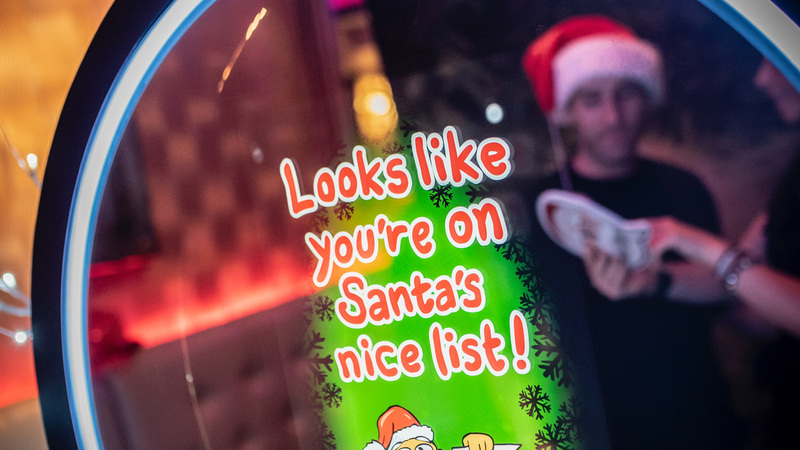 If you want to make your future event one to remember fondly for life, then renting our new Magic Mirror Photo Booth may just be the perfect choice for you. Hurry, these popular types of photo booth are usually reserved well-ahead of events! Call (800) 229-7278 / (800) A2Z PARTY – 7-days a week (9am-9pm). Glass that performs as a true work of art. Magic Mirror Photo Booth glass is a brilliant pure reflection on a top-quality mirror with amazing transparency quality producing crisp, crystal clear graphics. No one has ever had the mirror’s glass break. It’s durability was tested with a hammer strike and the glass remained intact. 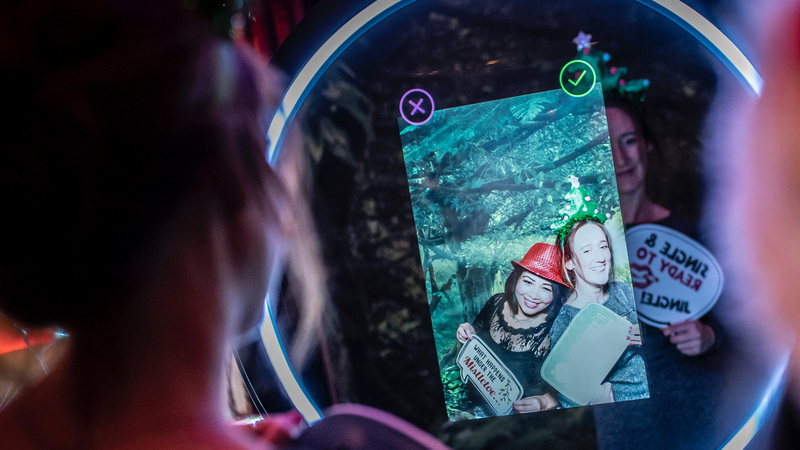 The MAGIC MIRROR PHOTO BOOTH comes with +200+ premium animations that are “ready-to-rock-and-roll”. Each professionally created to offer bright and colorful graphics that will engage your guests. These animations are tailored to specific events and even offered in a variety of different languages. All animations maybe customized with professionally recorded voice-overs. Our team loading custom animations that are fully personalized for the event. Animations might feature the married couple at a wedding or at a corporate event branded animations emphasize the corporate image. The potential of this dynamic feature is virtually unlimited. Your custom static images are supported too. Draw, sign or stamp! When this feature is enables your guests will have the ability to draw or sign their name directly on the mirror, which will then be printed out on the final image (prints and shared media). Choose from a our large library of popular “photo stamps”.